Skye living it up in Barbados! We love the dog tag we got for Lexi. The tags are very good quality! It shipped fairly quickly. They said that it would take about 21 days to ship and I got it in the mail a week after I ordered it! We might order another one to upgrade my other dog, Jax's tag soon. I highly recommend. Wonderful stylish product. Exceeded our expectation! Diamond was adopted from Humane Animal Rescue in Pittsburgh Pennsylvania. I Absolutely Love my New dog tag! And it looks Amazing on Tuco!!! It looks like he's wearing something very expensive, yet Very affordable! Looking so handsome with his new tag. We love our new tag! Looking so fancy! This is Baby. Aka the sweetest little girl! Absolutey adore this collar! It's just the right size and fits perfectly along my cat's collar. Plus the engraving is flawless and it's VERY sparkly. It's the cutest tag I've ever seen - definitely not one you'll find at any local pet store. It took about 10 days to get here but considering it's from Australia I can't complain! Definitely faster than I imagined. Just received Nicky's new tag today. It is perfect! Now my little sweetie has the perfect tag for his LV collar! Thank you! It has been a few years since I bought this tag and it still looks good like new. The engraving is still completely readable. Of course, Marie Ann is an indoor cat and not very active. Piper just got her new tag today! 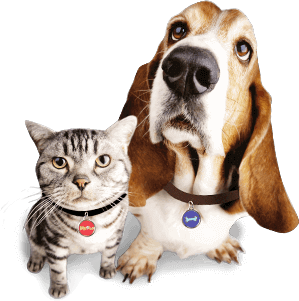 Indestructible pet tag. Very thick, strong ss. Information is deeply engraved and black. 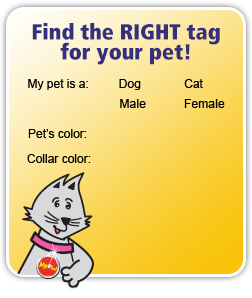 Angel's new tag is purr-fect!! It was truly made for her!! When I found it on your site, how could I not get it for her? Thanks Pet-Tags! I have had these tags since about 2010. They are tough tags. Nice heft to them. They keep their engraving well despite rubbing up against their rabies tag. 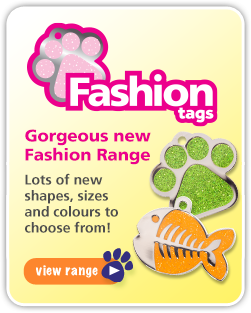 I would recommend these tags to any pet or any thing that needs a tag!!! Brutus and his Top Dog tag in 2008. Finally wore out and now replacing in 2017. Lasted nearly 10 years. Great tag! Now his collar is just as fabulous as Maurice is!! 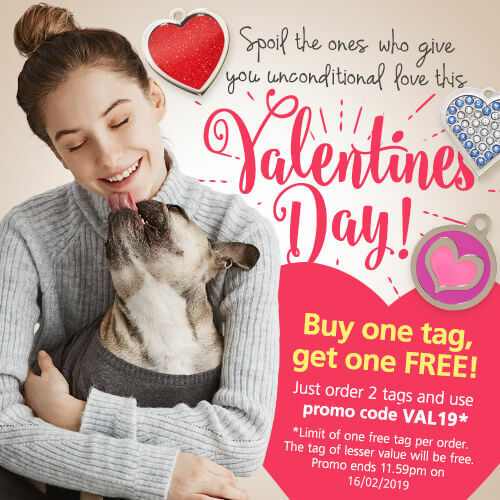 Thank you Pet-Tags!! Albie looking so handsome in his new bow tie! Miss Belle loves her new pet-tag! We love here new tag. It was worth the money spent. Sky in her new tag. Ready to go on her first therapy dog visit! Buddie was rescued He wandered into our yard looking for hope and a new home. Just sending a follow up on these boys. Think they were "Pet of the week/month" back in February. The pups are now 1yr old...still wearing their pet-tags.com tags. Just received Peaches' dog tag today! I really like it and am pleased with the quality. The tag makes her look as if she's wearing a little red bow tie. So cute! Knit is so comfortable with her new tag, she fell asleep with it. Thanks from Sunny Singapore! The boys looking smart with their new tags...just like big brother, Ralph! Just wanted to say hello. My brother Nike and I are waiting for our tags. Great tag, the first one I had just couldn't take it. This one, I've had several months now and it is still like new. Tough as nails. The tag is so awesome! The ingraving is well done. My dog looks so classy with that tag. Very fast shipping. Thanks a lot ! Sonia ! This is my Cassie. She has great big owl eyes. What a beautiful girl. Just wanted to give you guys a shout out, I've worked with hundreds of dogs and my two very active herders are on their 4th set of tags from you guys because we move interstate fairly frequently and I always want them to have updated IDs!! We LOVE your brass and stainless large round tags, they are classic and beautifully engraved. Thank you so much for a great and simple service. WHOO look at my new Pet-Tag, goes perfectly with my eyes! In case I do a Houdini I'll have my awesome pet-tag on with all my details! Don't we look grand in our new tags!